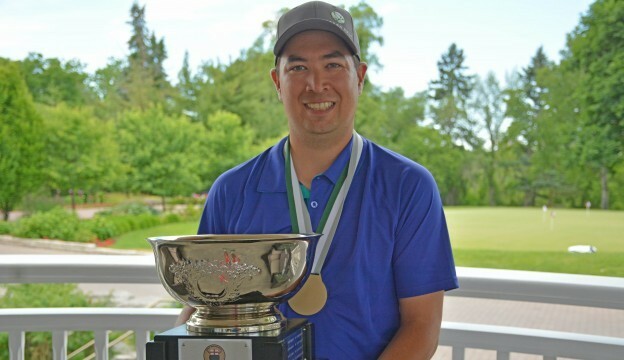 TORONTO – It was a dramatic finish to the Investors Group Ontario Men’s Mid-Amateur Championship, on June 23 at Lambton Golf & Country Club. After 54-holes, a champion was yet to be crowned. First and second round leader, Ryan Kings, and Matthew Sim were all tied at two-over and needed a playoff to determine a winner. On the first playoff hole, it was Sim who brought the crowd surrounding the 18th green, to their feet by sinking a nearly 20-foot birdie putt to capture the title. Heading into the day, Sim, from Oakville and the Mississaugua Golf & Country Club, sat in a tie for fourth at three-over for the championship. The 29-year-old got off to a great start with birdies on the fifth, sixth, and seventh holes and was two-under at the turn. He continued to lower his score on the back nine with three more birdies on 10, 12 and 14 and was four-under for the day, one-under for the tournament, with three holes to go. However, after a bogey on 16, he found the trees on 17 leading to a double bogey. He pared the 18th but was watching the final group to see where he would finish. The final group included Kitchener’s Kings and Brooklin’s Ashley Chinner, who began the round in first and second place respectively. Kings, a Deer Ridge Golf Club member, started the day with a four-shot lead but gave it back as he finished six-over on the front nine. He would get one back with a birdie on 11, but still found himself tied for the lead at two-over heading to the 18th. On 18, Kings drained a lengthy par putt to force the playoff with Sim. Kings managed to par the playoff hole but there was nothing he could do except watch as Sim sank the winner for the title. Sim finished the tournament at two-over (75-72-71-218), Kings went (69-72-77-218). As for Chinner, a member of Coppinwood Golf Club, he too had a chance to join the playoff for the title. However, it all came down to 18 where he settled for a bogey dropping him to a share of the bronze medal. Chinner finished the tournament at three-over (71-74-74-219) and won the Mid-Masters Championship. He shared the bronze medal with North York’s Charles Fitzsimmons. Fitzsimmons, from Thornhill Golf & Country Club, began the day in a tie for seventh at four-over. He finished the round at one-under to end the tournament at three-over (73-75-71-219). Fitzsimmons and Chinner played off for the third Team Ontario spot for the team competition at the Canadian Men’s Mid-Amateur Championship, Aug 23 – 26 at Golf Château-Bromont in Bromont, Quebec. Fitzsimmons claimed the spot in the second playoff hole. Golf Ontario would like to thank Lambton Golf & Country Club along with their staff and volunteers for hosting the event. Thanks also to the Golf Ontario volunteers and to title sponsor Investors Group for their continued support of golf in the province. For full tournament information, including the final leaderboard, click HERE.